Asian migrants are inextricably linked to contemporary debates concerning the nation-state, neoliberalism, globalization, and transnationalism. This volume brings together these streams of inquiry and proposes a synthetic approach to examine various processes of migration and community formation on a global scale. 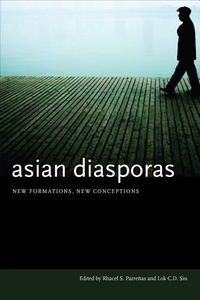 The essays included in Asian Diasporas look at the worldwide dispersal of Asian populations through the lens of diaspora. They illustrate the underlying structures of inequality that create diasporic communities--the cultural barriers that impede belonging to the place they inhabit and the place they call "homeland," the unequal processes that embody globalization, and the social inequalities in host and origin country alike. Five major themes connect and cut across the collection: the recognition of inter-Asian strife; the persistence of the nation state; the salience of race, ethnicity, gender, and sexuality; the forces of labor, colonialism, and globalization; and the centrality of culture.